I held my bag close to my body as I climbed up the portable passenger stairs to the plane. The aisles were just barely wide enough for one person. Outside I could hear the attendants say there was no room for roller suitcases and they would need to be checked. 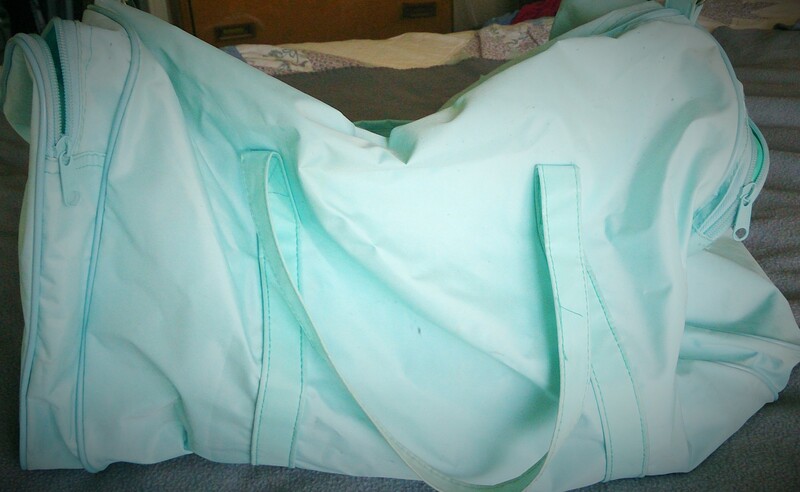 My bright blue duffel style bag was not full and not large by any means, but I found it awkward and difficult to manoeuvre in the constricted space. When I reached my seat, my bag seemed to engulf it. I tried to stuff it under the seat in front of me. The end stuck out crowding around my feet. On a larger plane, this would be a tiny bag; on this plane it seemed to grow before my very eyes and I cringed as the airline attendants walked the aisle just before take-off, anticipating that moment of them pointing at my feet and declaring “that bag is too big”. Of course it wasn’t and of course I knew it, but the confined space of the small propeller plane had me imagining my carry-on as this swelling giant piece of luggage that would weigh down the aircraft. The propellers began to spin, the engine roared beneath my feet, vibrating the floorboards, giving me and old lady RA reason to my moan. A whirlwind weekend wedding on the same weekend of my mother’s birthday meant a fast 48 hour trip to the next province and back. Our destination was the little prairie town of Lethbridge Alberta. We were to fly in Friday afternoon, returning home Sunday afternoon, and then drive out to meet my mother for her birthday dinner. The brevity of this trip meant I didn’t need to pack a full suitcase – a carry-on was all that was required and oddly enough, it presented an unusual problem. How does one pack lightly to a place with changeable climate and to accommodate the whims of old lady RA? Not only did I need to pack the essentials, I also needed to pack the items that help keep me comfortable and quash the onset of arthritis symptoms. I was faced with one of the many challenges of travel with chronic illness. I discovered it’s far easier to pack for a longer trip than a short one. The suitcase gets checked so there’s no worry about restrictions for carry-on – you have the space to include all the things you might need. There’s no agonizing about leg room, about the weight of your carry-on bag and whether it will fit in the bin space overhead or under the seat in front of you. There’s no fussing over restrictions of liquids. At home I have every need at my disposal – cots, braces, water bottles, heating blankets, creams and medications – all things easy to pack into a suitcase when you are planning a week’s vacation, but are cumbersome in a small carry-on bag. How to decide what stays and what goes? Packing lightly is something with which I have always struggled in an effort not to bring too much, but with the onset of RA, I had accumulated many devices on which I depended to help me manage my symptoms, and many of them were committed space hogs. I lay all my things on the bed and pondered – 48 hours’ worth was all I needed. I was able to condense my clothing options easily enough – one travel outfit, one outfit for the wedding. One pair of shoes to go with my dress, one pair to wear the rest of the time. I was able to condense my toiletries – liquids less than 100 ml were the only things allowed for carry-on, so miniature travel bottles of the necessities (contact lenses solution, toothpaste, deodorant) was all I really needed – these were my basic essentials. Now I had to decide what I would need for arthritis. A lot can happen in 48 hours. Unexpected flares can pop up overnight. Pain can intensify, fatigue can drag you down. How could I possibly decide on what to arm myself with in a mere 48 hours? I stood in my bedroom and stared at all my comforts – my heating blanket, my hot water bottle, my anti-inflammatory creams, and my braces. It was tough to weed out the important things, but in the end I decided on my daily medications, some NSAID’s, my ring splints and my elbow brace. I couldn’t bring my creams due to carry-on liquid restrictions and I also had to keep in mind that with our second plane being much smaller, there would be no overhead bins, just the space beneath the seat in front. In the end, just like surviving the random whims of arthritis on a daily basis, deciding what to pack came down to the best estimation of what my weekend would bring, hoping I would be able endure with my selective choices, and that old lady RA would allow me to pass through security with no objections.